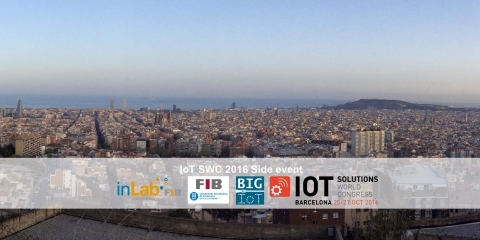 “IoT: New business paradigm for SMEs?”, is the IoT Solutions World Congress side event organized by inLab FIB and the BIG IoT project. Which focused on new business paradigms based on IoT implementation in industry, services and daily life of citizens. The goal of the event, divided in three sessions, was to cover insights in IoT, Big Data Analytics and Cyber Security, both from EU and local perspective. Topics covered ranged from the opportunities for SMEs offered by the H2020 BIG IoT project and the Barcelona Pilot, to the added value IoT represents to the whole cycle of industrial business models. Also mentioning Cyber Security in terms of awareness, vulnerabilities and solutions. The event's agenda consisted of three sessions, you can consult the presentations here. Moderator: Mrs. Iwona Maryla Maciejewska, inLab FIB UPC. Participants: Mr. Benito Cerrillo (Vicedean of New Industrialization in Informatics Engineering Professional Association of Catalonia), Prof. Ernest Teniente and Prof. Josep Casanovas, inLab FIB UPC. BIG IoT Marketplace & API, presentation by Prof. Juan Hernández Serrano. inLab FIB & Industry 4.0, presentation by Prof. Ernest Teniente. Modelling and Simulation for Industry 4.0 SUCCESS CASES, presentation by Sr. Benito Cerrillo. Cyber Security - awareness, vulnerabilities and solutions, presentation by Prof. Manel Medina.